A sacred tree in Gangjeong was designated as a cultural treasure. 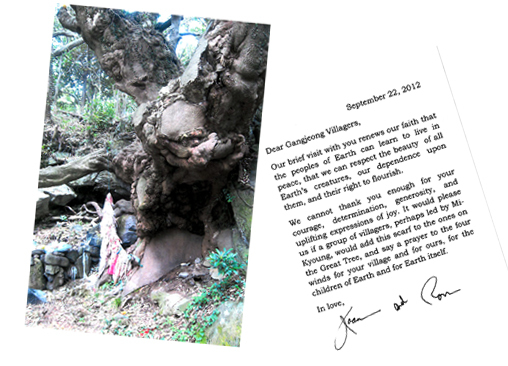 A sacred tree in the Gangjeong Village was designated as a Cultural Treasure No. 544. The Cultural Heritage Administration of Korea (CHAK) reported on April 26, 2013. Photo by Cho Sung-Bong, Benjamin Monnet in front of the sacred tree in the Netgiriso shrine, July, 2011. ‘The evergreen tree, located near the camphor tree habitat (natural treasure No. 162), and belonging to the family of Elaeocarpus sylvestris var. ellipticus is a sacred tree by Jeju folk custom. The villagers have paid their faithful service to it for a long time. Its folk custom and culture value is evaluated high. The tree’s age is inferred to be about 500 years. Its biological value is high because of its large size with 11.5 m height and very unique shape. 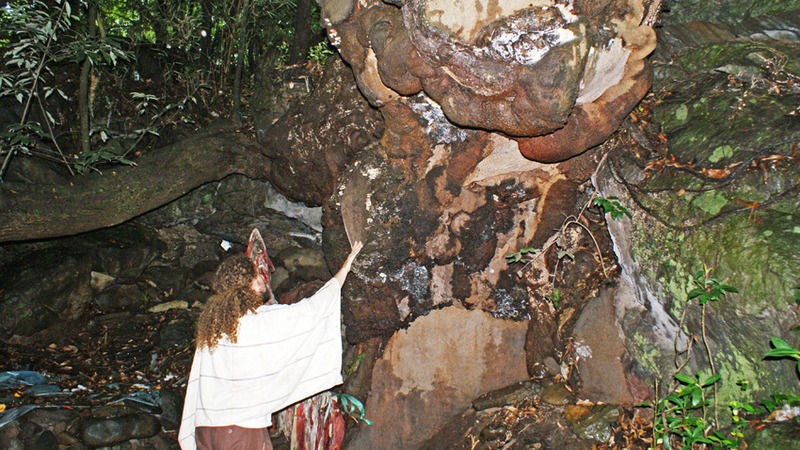 The tree is located at the Netgiriso shrine(nicknamed Illuye Grandmother shrine). The word ‘Netgiriso’ means ‘four good omens of fall, rock cliff, sweet fish, and clean water.’ The Netgiriso is the water source of the Gangjeong stream that feeds 70 % of drinking water for about 200,000 citizens of Seogwipo City. It is also a habitat of mandarin duck, natural treasure. The Netgiriso itself is a sacred site where you would not even dare to swim but pay respect and prayer. Many environment lawyers and activists during the IUCN co-sponsored WCC visited the sacred tree and Netgiriso and expressed their awe to them. See here. 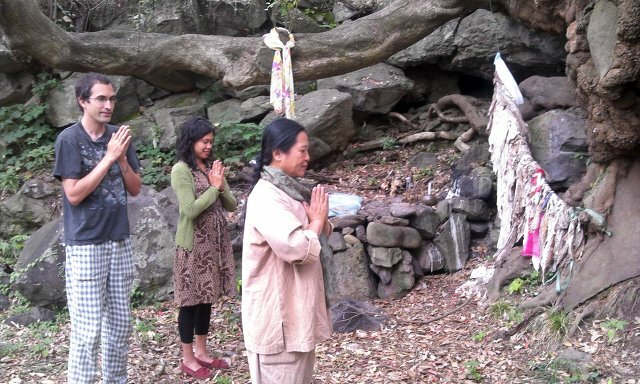 Many photos of the sacred tree and Netgiriso by Dir. Cho Sung-Bong are available here. Dir Cho took the photos in July 2011. You can see two internationals of Benjamin Monnet and Wang Yu-Hsuan (Emily Wang) there. 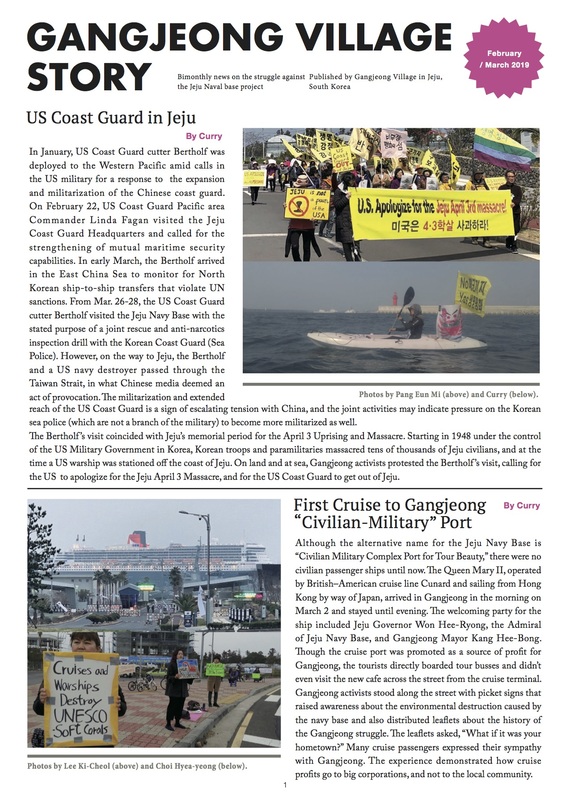 Both have been forcefully deported by the South Korean government, in March 15, 2012, and April 26, 2013, respectively. It is told that the navy is planning to build an entry road in the site about 100 m distance from the tree area.